If one of the two colours has a larger image area this should be printed last. This general rule may be reversed if one of the two colours is an opaque ink and the lighter weight ink has to be printed over it. If the heaviest image is printed first it may be difficult to print the second colour onto it. When the first ink film dries hard the second printing lays the liquid ink on the surface very much like putting water over the surface of glass. The globules of ink reticulate and refuse to flow to an even film giving the print a mottled appearance.this phenomenon is called 'poor trapping' or 'refusal' (see Trouble- shooting for remedies). If the heaviest image is printed first and the ink is not perfectly dry before the second colour is applied, the first print may set off onto the blanket cylinder to produce image doubling or contamination of the second colour. As a general rule when using transparent inks, the lightest image is printed first followed by the heavier. When two inks are printed, one on top of the other, the final colour ink will produce a dominant cast to the combined hue. For example, a green hue produced from yellow and blue inks will be yellower if the yellow is printed last. This occurs because the light reflected from the surface yellow predominates over the underlying colour. This must be taken into account when attempting to match a third colour made from two other colours. Opaque inks tend to obliterate the surface on which they are printed. A transparent blue printed over an opaque yellow will give a more satisfactory result than opaque yellow printed over the blue. Full colour printing uses four ink colours of Cyan, Yellow, Magenta and Black. These inks are transparent and can be printed in any order but the recommended sequence is Cyan first to give clear visual prints on the first run. Yellow next to allow the weight of yellow to be determined by the green produced in combination with Cyan. Magenta usually follows next with Black to finish. This sequence may have to be altered however by the following considerations. 1 . Many colour jobs are proofed before a run and the progressive book may indicate a different sequence of printing the colours. 2. The last colour printed may impart an overall cast to the final print. For example, the order Cyan, Yellow, Magenta and Black will produce a slightly reddish cast to the final print while a greenish cast will be produced if the order Magenta, Yellow, Cyan and Black is used. In most cases this will not be important but it can have a significant effect when, for example, an attempt is made to match an advertiser's colour of lipstick. 3. The trapping of one ink upon another has to be considered. If trapping is likely to be a problem then the colour with the heaviest coverage should be printed third or last in the sequence. 4. The traditional order of printing yellow first has the drawback of printing sheets of white paper on which Yellow is difficult to evaluate. This is especially true with gloss papers. A densitometer is neccesary for this order. Modern muticolour press design falls into two categories. 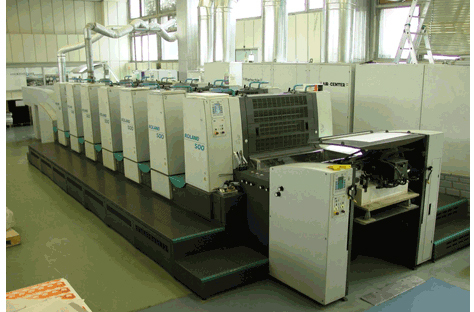 The modular unit press is based on single printing units which are coupled in-line to form two, three, four, five and six unit machines. The second category is based on a two colour press design (which may have a common impression cylinder) which is coupled in tandem to form a two, four or six unit press. The modular unit design offers greater combination flexibility and lower productions costs, while the tandem press offers higher standards of registration between units. See illustration 93. Each separate printing unit on the multicolour press is based on the same working principles as the single colour press. Differences of design occur in the method of sheet transfer between each printing unit. The prime object here is to avoid sheet marking and to maintain good register as the sheet is passed from one set of grippers to another. This is generally achieved by drawing the sheet over a number of transfer drums (each complete with grippers) which may number five, three or single drums. Sophisticated machines make use of high velocity air to give sheet support without marking.